One of the challenges I faced in writing Newton’s Ark was tracking several parallel story lines until such time as they all came together towards the end of the book. At the time the only tool I had at my disposal was Microsoft Word and its Outline view. It got the job done but it was a struggle, like driving a screw with pliers. You can do it, but why would you when there’s this thing called a screwdriver? Soon after I began on the sequel, Faraday’s Mine, I realized I was going to have the same problem, only more so. Not only did I need to keep the story line straight, but it had to be consistent with what had already happened in the first book. And I wanted to raise the intrigue a level, making the web even more tangled. 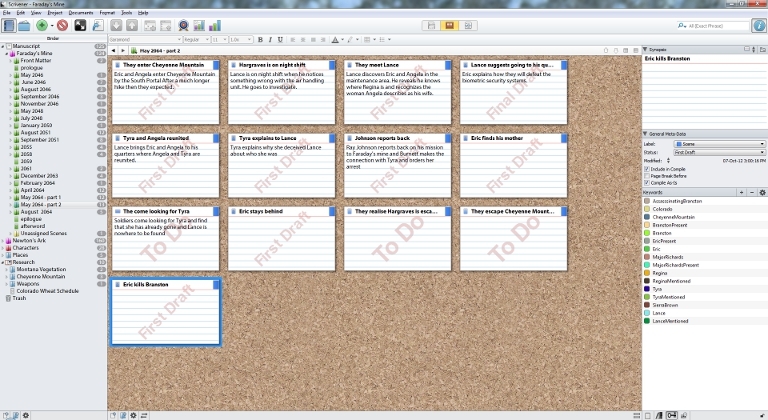 Fortunately I discovered a wonderful program called Scrivener which allows me to organize the book into chapters and scenes using the metaphor of index cards on a cork board. Now I can easily create the structure of the story and then change it on the fly. I can attach notes to each scene to remind myself what I plan to write as well as attaching keywords for characters and locations to each of the scenes so I can see who is doing what to whom and where. Here’s a look at one of the chapters. If you look real close you might just be able to figure out what is going to happen (warning spoilers – assuming I don’t change it or I’m not just playing with you). It has turned out to be one of those tools I didn’t know I needed until I found it. Now I couldn’t imagine writing another novel without it. This post brought to you by author, D.A.Hill.